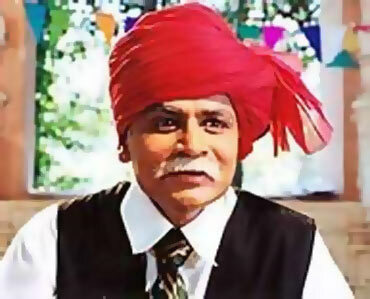 Raghubir Yadav is probably the only Indian actor to feature in three Indian Oscar-nominated films, Salaam! Bombay, Lagaan and Water. Yet, he may not find a place in Hollywood, like some of his actor colleagues like Irrfan Khan. In fact, we hardly ever see the actor in Bollywood films these days. He did not even accompany Aamir Khan and wife Kiran Rao to the Sundance Film Festival, where his new film Peepli Live! was being screened. 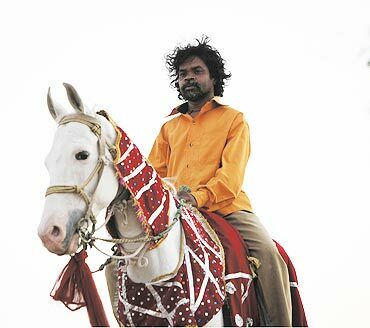 Peepli Live!, which has been produced by Khan, made its rounds at the recent Berlin International Film Festival too. The film explores the serious subject of farmer suicides. Raghubir talks to Patcy N about the film, and about being a farmer himself. What is Peepli Live! about? The film is about farmer suicides. A farmer declares the date of death. That attracts the media to his village, and causes a huge problem. Why is it called a dark comedy? It shows some uneducated farmers meeting city people, who don't understand their way of life and vice versa. These farmers become a joke for these urbanites. But these jokes are actually underlying the farmers' tragedies. Life has been treated like a joke in this film. Did you get this role because of your close association with Aamir during Lagaan? No. It was director Anusha Rizvi's idea to cast me. She recommended my name to Aamir and we had a costume trial to see whether I looked like a farmer or not. We shot some scenes also, to see whether I looked authentic. After seeing those videos, Aamir thought I should be cast in the film. I don't know whether Aamir knows but I am a farmer by birth. I come from Jabalpur, Madhya Pradesh. I left my village at the age of 15 to become a singer. I turned to acting to support myself. I joined a Parsi theatre company and lived with them for six years. From there, I enrolled in the National School of Drama and studied there for three years. Later, I started teaching there, for 10 years. I got my first break in Massey Sahib. But neither did I become a singer nor did I become an actor! I like music only because it gives me mental peace. What was working with Aamir like? Aamir is a very understanding producer. He makes everything easy for you. All the people on the film are tension-free. They know they will not be hassled for small things because Aamir will take care of everything. He is like a huge umbrella that protects you from all problems. We stayed in Bhuj, Gujarat, for five months. There were quite a few problems but we never felt them because of Aamir. We were shooting in the months of May and June, when it gets really hot. Then we shot for the film in Bhopal, where it was very cold. We would wake up at 4:30 am and travel to the village, which was 60 km away. There was no pressure from Aamir to finish the shoot quickly and return. We did it in a relaxed way. Once Aamir believes in the script and the director, he sees to it that the unit faces no problem. Aamir came on the sets just once. And only once he asked for a scene to be reshot. Otherwise, he never interfered. You have worked with a lot of tribals in the film. What was the experience like? There were local farmers as well as theatre actors in the film. But I thought the local farmers performed better; they were so natural. It is usually difficult to work with actors but these farmers were so natural. Anusha would make us rehearse the scenes daily. We also had a workshop for the actors for 15 days in Mumbai and six days in Bhopal. So everyone knew each other and were comfortable with each other. The dialogues have a touch of Bhundelkhandi dialect but it is not difficult to understand. What do you think about the farmer suicides? We forget that there cannot be life without farmers. But they are still so backward and nothing is being done to uplift them. My father had a lot of land but the government took it away to build an agricultural college. They gave us a small patch of land in return. My brother is now trying to restore it, and do some farming. But there are too many difficulties. It is difficult to get a hand pump or tube well on your land -- you have to bribe so many people. I want the government to look into the matter. There are so many villages with no electricity. Even today, they have to rely on rain. Before we had zamindars, who mortgaged land, and now, banks are doing it. So the farmer gets frustrated and commits suicides. Why didn't you go for the Sundance Film Festival where the film was screened? I was not required to go. The producer and director were needed. I have not seen the film yet but people who have seen it have told me that it is very nice and has an earthy feel. Do you think this is a role of a lifetime, which is getting a lot of attention, thanks to the film festivals it's doing the rounds in? Yes, Peepli Live! will boost my career. If it does, that will be good. The film industry should get a bigger boost than me. I want better films to be made in India. Not many good movies are being made in India, especially sometime back when all the stories were similar. We have such a rich culture and so many stories to tell but we only concentrate on the hero and heroine. But you play a lot of rural roles. Do you think your look is restrictive? No, I don't do only a particular kind of roles. I have also played a Nawab in Meenaxi. But yes, you are right. I get villager roles a lot because if you play one particular role well, people will typecast you. They think that if they take this actor, they will not have to do a lot of hard work on them. But I have seen to it that I get different kind of roles. It's okay if I don't get any films but I don't want to do the same kind of roles. If I don't get different roles, I will give up acting. We haven't seen you in too many Hindi films off late. Are you bored with the kind of scripts you are getting? Yes, that is one of the reasons. I'm not getting the kind of movies I want to do, and I don't like the roles I'm being offered. I don't want to do any film that I will regret later, and one that my audience won't like. I will never be satisfied with my career because one life is not enough to do what you want to do. There is so much more to do. I like my theatre characters, especially the one in Barry John's The Fool. Among the films I loved doing are Salaam! Bombay, Meenaxi and Massey Sahib. One film that I loved but did not get released was Ashray. It was about a person who locks himself in a house. I also loved doing telefilms like Raman Raghav. You featured in some great television shows like Mungeri Lal Ke Haseen Sapne and Chacha Chaudhary. But we haven't seen you on the small screen in a long time. All the serials look alike nowadays. Some have tried to change the trend but television is no longer interesting. There are only a few good shows like Balika Badhu and FIR. I don't want to get involved in daily soaps. I did Chacha Chaudhary for two-three years but realised that I cannot do the same characters for too long.